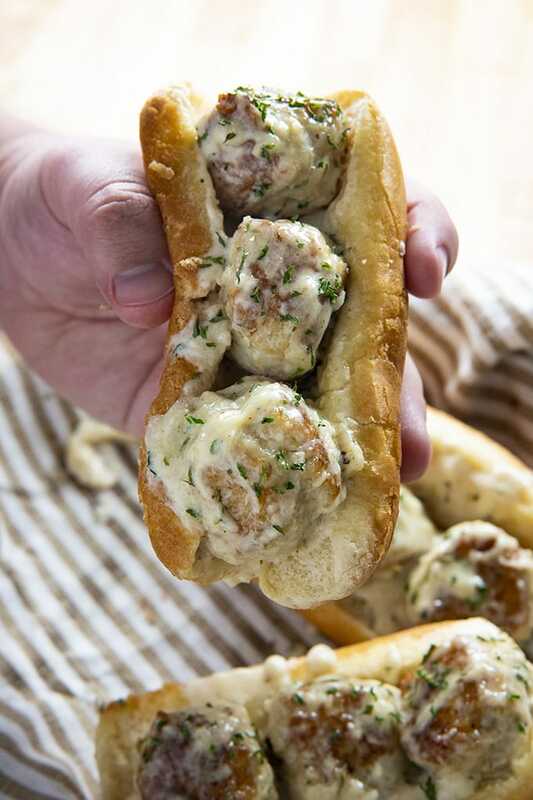 Chicken Alfredo Meatball Subs feature mouthwatering and tender chicken meatballs in a rich and creamy homemade Alfredo sauce! Turn them into meatball subs for a super easy dinner! The key to this recipe is the chicken meatballs. Ground chicken doesn’t have a whole lot of flavor on its own so it is important that these are seasoned well and that they come out juicy and tender. I season my ground chicken with salt, pepper, garlic and onion powder, and Italian seasoning. We also add parmesan for extra flavor and a drizzle of olive oil to keep them moist. Panko and egg bind the meatballs together. When you first sear the meatballs they won’t be cooked through completely, but, they should be nicely browned on all sides. They will finish cooking in the easy alfredo sauce! That also gives them tons of extra flavor! Meatball subs are so easy to make in one skillet! No need to pull out any special equipment, or wait for the meatballs to bake! You will form your chicken mixture into balls, then sear them over medium-high heat until browned. Next, remove them from the pan and make your Alfredo sauce. You will make the sauce without adding the cheese at this point, and add the meatballs back to the pan. Allow them to simmer, covered, for about 10 minutes until they’re completely cooked through. While the meatballs simmer, I lightly butter my hoagies (or you can just use hot dog buns) and broil them for a couple of minutes until they’re golden. Once the meatballs are ready, you can stir the parmesan cheese into the meatballs and sauce just until the cheese has melted. Then add the meatballs to your prepared buns, sprinkle with parsley if you wish, and you’re ready to eat! In a large bowl mix together the ground chicken, seasonings, breadcrumbs, parmesan cheese, egg, and ONE TABLESPOON of the olive oil. Mix just until combined and form the chicken mixture into about 12 meatballs. Heat the remaining tablespoon of olive oil in a large skillet over medium-high heat. Brown the meatballs on all sides and then remove them to a plate. Turn the heat on your stove to low. In the same skillet add the butter and cream. Simmer on low heat for 2 minutes. Whisk in the garlic, Italian seasoning and the salt and pepper. Add the meatballs to the skillet, cover with a lid and simmer over low heat for 10 minutes. While the meatballs are simmering, preheat your oven to broil. Butter the hoagie rolls if desired and toast under the broiler for 2-3 minutes until golden. 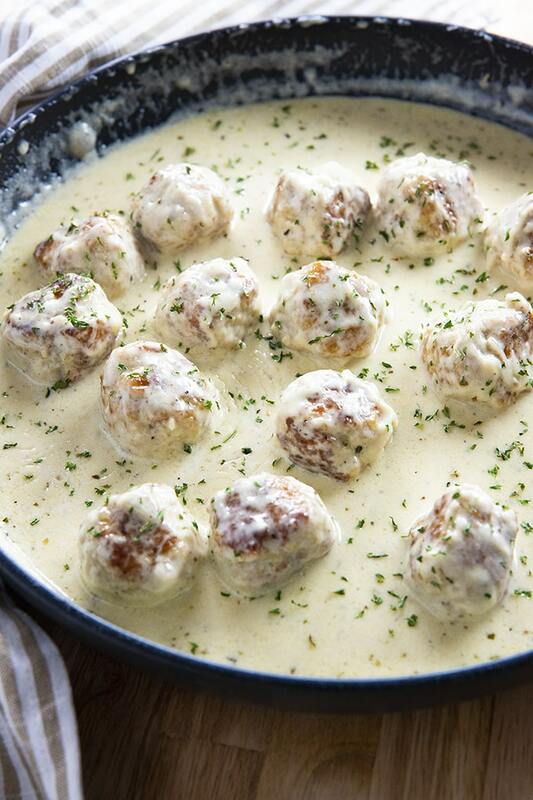 After 10 minutes, stir the parmesan cheese into the meatballs and sauce. Serve the meatballs in the prepared buns. 0 Response to "CHICKEN ALFREDO MEATBALL SUBS"